New Delhi, Mar 12 A day after the BJP's resounding poll victory in Uttar Pradesh, Prime Minister Narendra Modi today said a "new India" is emerging and it stands for development. He also asked the people to take a pledge and express their commitment on his Narendra Modi Mobile App towards building a new India. "A new India is emerging, which is being powered by the strength & skills of 125 crore Indians. This India stands for development," Modi tweeted. "When we mark 75 years of freedom in 2022, we should have made an India that will make Gandhi Ji, Sardar Patel & Dr. Babasaheb Ambedkar proud," he added. These tweets came a day after the BJP got astonishing poll results in Uttar Pradesh where it stormed to power with three-fourths majority, decimating the rivals SP-Congress combine and the BSP. BJP also scored a massive victory in Uttarakhand winning 56 of the 70 seats in the state to storm to power, reducing Congress to minuscule minority in the state Assembly with a poor tally of 11 seats. New Delhi, Mar 12 A day after the massive poll victories in Uttar Pradesh and Uttarakhand, Prime Minister Narendra Modi today appeared to be setting his sights beyond the 2019 Lok Sabha elections as he asked the countrymen to join him in building a ‘new India’ by 2022. He asked the people to take a pledge and express their commitment to building a new India on his Narendra Modi Mobile App. “A new India is emerging, which is being powered by the strength & skills of 125 crore Indians. 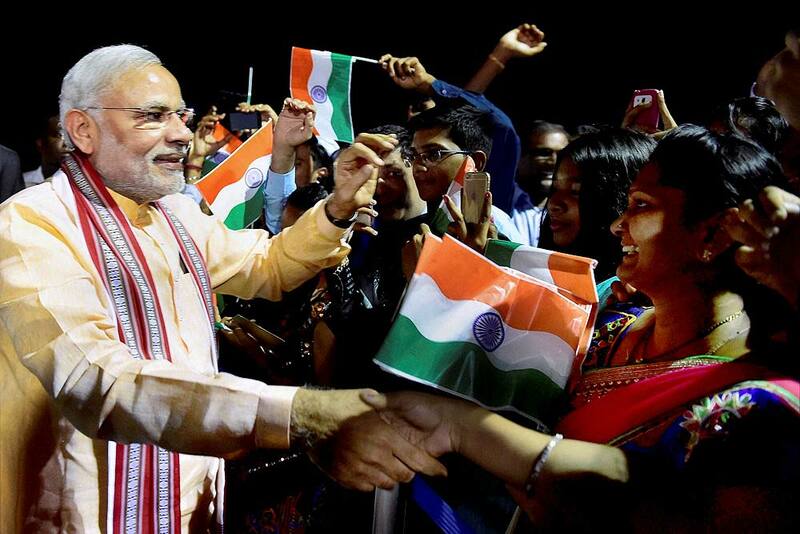 This India stands for development,” Modi tweeted. “When we mark 75 years of freedom in 2022, we should have made an India that will make Gandhi Ji, Sardar Patel & Dr. Babasaheb Ambedkar proud,” he added. He also listed out a set of pledges which he wanted the countrymen to take. Modi wanted the countrymen to pledge that they stand for a corruption-free India, that they will undertake cashless transactions, that they will dedicatedly work towards a ‘Swachh Bharat’, that they will ensure a drugs-free India. The Prime Minister also wanted the people to pledge that they will support and encourage women-led development, that they extend complete support to an ‘accessible India’, that they will stand for an India of peace, unity and harmony and that they will be job creators, not job seekers. This came a day after the BJP, powered by a spirited campaign by Modi, posted landslide victories in Uttar Pradesh and Uttarakhand, decimating the rivals.